Cooking pinto beans is a simple process, and makes for a wonderful side or main dish. Learning how to cook pinto beans is equally easy and it’s also kinda fun! Boil the beans and 4 cups of water and simmer for 2 minutes. Cover and let stand for 1 hour. Drain and rinse beans, return to pot. Add 4 cups of water and all other ingredients and stir. Bring to boil, cover and simmer for 2 1/2 hours adding more water if needed. Remove the meat on the pork hocks and stir into the beans. 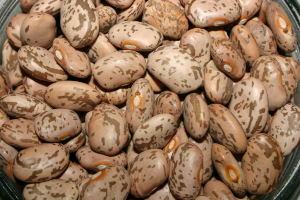 Pinto beans are high in fiber and help control cholesterol. Whether your are having hamburgers or tacos, this dish will perk up any meal. Your random trivia for the day: The word “pinto” is Spanish for “Speckled”.